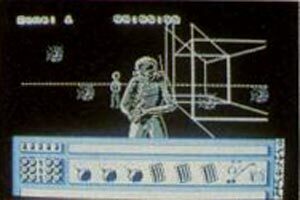 A rather ambitious game from Martech on the C64 indeed… just look at the screenshots! 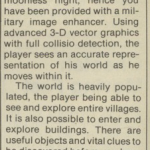 The story goes as follows (Thanks to a CVG clipping).. “The game was to be a 3D vector graphic arcade adventure where you control a futuristic mercenary out to steal plans for a revolutionary orbital interceptor code-named the CK 23. Able to take off the land like any conventional aircraft, the CK 23 can lie in wait in orbit ready to blast back into the atmosphere at frightening speed, to intercept and destroy enemy missile and laser weaponry. The CK 23 test development site is the most secret and heavily guarded military complex on earth. Situated on a lonely and now deserted island, it is guarded by armed patrols, tanks, electric fencing and surveillance cameras. The island is also criss-crossed by a shuttle network which used to allow for rapid transport for the now departed civilian workforce. It is your mission to explore the island and find the heart of the development complex. Once there you must steal the design of the CK 23 and then set a time delay mine in the nuclear reactor. The action takes place on a moonless night, hence you have been provided with a military image enhancer. This sums up a rather complex sounding game and one which sounds very exciting. 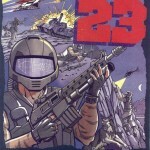 The game got a release on the Amstrad and Spectrum, and the reviewers were quite damning. After the impressive effect wears off, you’re left with quite an average game. The lack of a C64 conversion suggests that it didn’t have enough poke to do things at speed and it was canned early on. Although CVG mentioned the C64, the adverts only stated Spectrum and Amstrad – so was it dropped early? 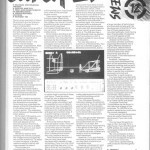 I should of mentioned it was Page 6 (news) section of Computer Gamer, Issue 27 that claimed C64 Catch 23 was due month after the ZX Speccy ver. 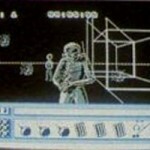 The C64 version was said to be following a month after the ZX Spectrum version (along with the Atari ST version) in issue 27 of Computer Gamer Magazine.